I don’t recall who first taught me to make this 4-strand braid. 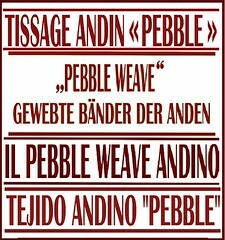 All I know is that I already knew how to make it when I went to learn to weave in Potosi. When I had finished my pieces on the staked-out ground loom, my weaving teacher offered to teach me to make a 4-strand braid. I told her that I already knew how to make one and she looked at me in disbelief challenging me to show her. I did and both she and her sister could hardly contain their laughter! Then Hilda proceeded to show me how they do it by placing the end loops of the warps on their fingers and passing them to and fro from finger to finger from hand to hand. I love it!! It works beautifully to finish the warp ends on bookmarks, key fobs and wall hangings which are naturally in loops. Here are two tutorials for the two methods. The first has step-by-step photos of the way the strands move to form the braid. You can experiment with it and see how it best suits you to hold the strands in your hands. I usually work this on the end warps of a bookmark or key fob and so have the woven piece anchored between my knees. If I am just making a long braid on its own, I tie a knot in the end and anchor it under a heavy book or have someone hold it for me. With this first method you can make a braid as long as you like. Just make sure you pause now and then to untangle the free ends. 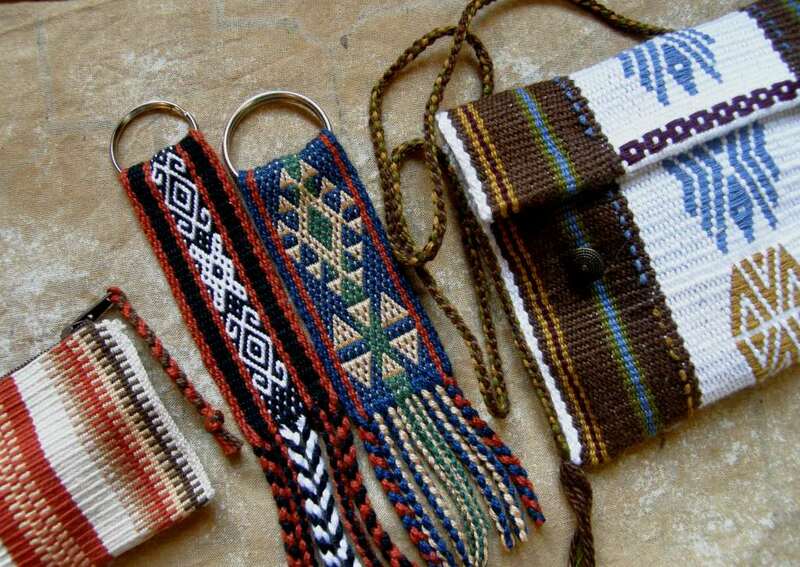 4-strand braids used to finish keyfobs, as edging and a strap for a small purse and as a zip pull on a coin purse. On the keyfobs I didn’t want to finish the braids with bulky knots so I painted the ends with diluted white glue and then pressed the ends together as the glue dried. I used two colors for the braid in this tutorial – two strands of color A and two of color B. The order of the strands to start braiding is B-A-A-B as shown below. LEFT: Step1: Arrange the 4 strands in this position. This is the “home “position. RIGHT: Step 2: Cross strand A1 to the right over the top of A2. LEFT:Step 3:Strand A1 continues moving to the right passing over the top of strand B2. RIGHT: Step 4: Strand A2 continues moving to the left passing under strand B1. Now the two white strands are in the center. LEFT: Step 5: Strand B2 crosses to the left over the top of strand B1. RIGHT: Step 6: B2 continues moving left over the top of the orange strand while B1 continues moving right under the orange strand. Now the two orange strands are in the middle. This completes the sequence. The orange strands will always cross left over right and the whites right over left. 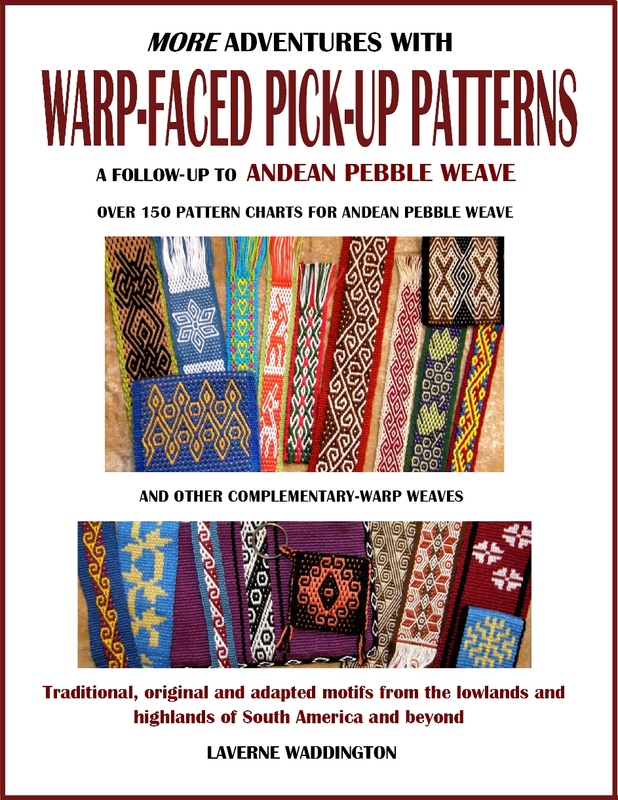 I have enjoyed teaching this to many weavers in Ecuador who had never seen it before. 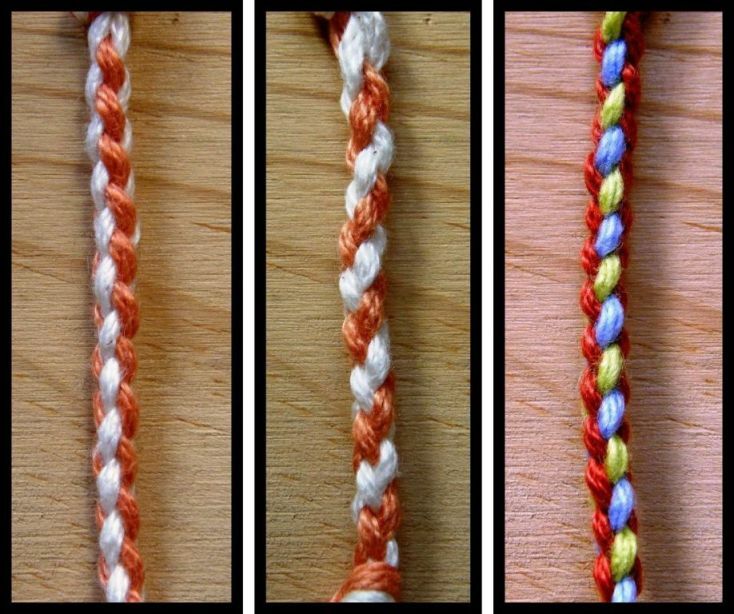 Three versions of the 4-strand braid. LEFT: The finished braid from the above tutorial with strand order B-A-A-B, that is, white- red- red- white. CENTER: The same braid with a different color arrangement. 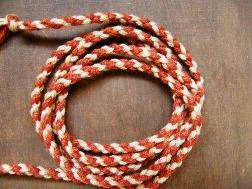 The starting order in this braid is B-A-B-A, that is, white- red-white-red. 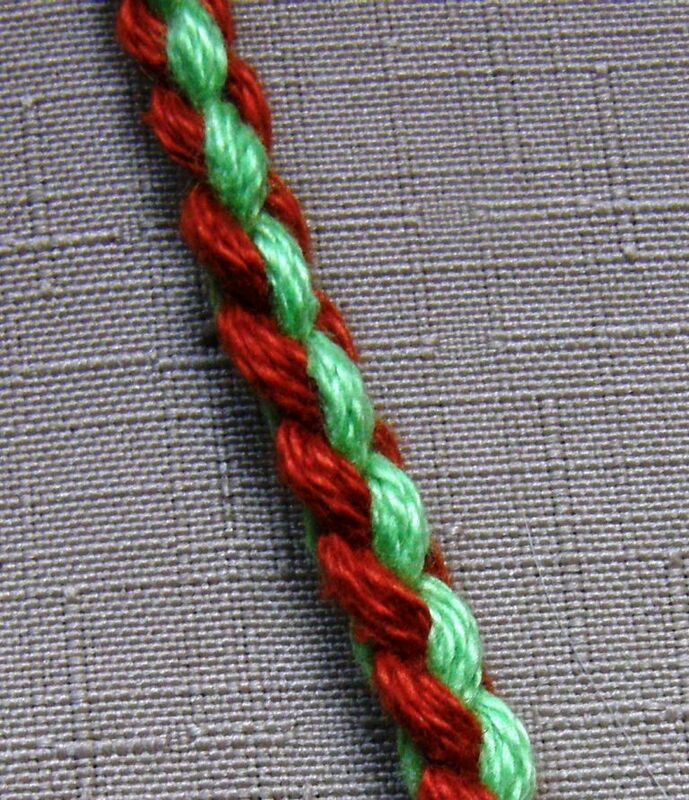 RIGHT: This braid has three colors and the starting order is B-A-C-B. The second tutorial is by video so I can show you Hilda and Julia’s method on the end loops of a warp. It is fast and fun! The finger-loop method used by my weaving teachers and the method I show above actually produce structurally different braids. Nevertheless, both methods produce pretty braids. Using the looped method, I find it harder to make a really long braid for, for example, the strap of a bag, as it is harder to maintain tension. I am sure that experienced loop braiders have solutions to this problem. I made another video (Sep 2012) showing how to create the braid structure that I show in my step-by-step pictures above when using loops. This is my favorite arrangement for a four-strand braid which looks great in two, three or four colors. The loop method is fun and fast and so convenient for finishing a weaving as you already have looped warp ends with which to work. However, I still prefer the way shown in the step-by-step pictures if I need to make a very long braid to use for the strap of a bag or edging on a large woven piece. In the video I use two colors, red and green, and just made up the method. There could well be a more efficient way to do it which more experienced braiders may know. I hope you find these braids useful for your own projects. Very interesting tutorial about the 4 strand braid. I taught my granddaughters how to make a five strand braid with five loops. I bet they would love to learn this one too. Thanks. Hi, Laverne! Nice pictures of you spinning Alpaca with a friend. One of the members in the Spinning Guild I belong to went to South America and brought back several low whorl support spindles to the “Maker’s Faire” and I got to try several of them. She let me have one! I’m a pretty big collector of spindles myself. Some I made some I purchased. I started on a new backstrap project. I acually started weaving. I think the pebble weave will become my favorite type of backstrap weaving and the weave we did making the key fob. (Remember, mine became a scissor fob and I get a lot of compliments on it). I love the two shades if Green I chosed. I went through my yarn stash from what people have given me (since I’m a yarn-aholic). I’m usiing some bulky acrylic yarn for my project I’m weaving and it’s coming out good for not being the best quality yarn to weave it. I’m just using that yarn for practice. I’m making another backtrap. I love the collections of backstraps you brought to the workshop, plus I’m building up enough practice before I attempt to make something big like a bag using better yarn. This acrylic yarn is very sticky. I still have plenty, so what I need to do is add more spin to this yarn and maybe it won’t be so sticky. It’s just for practice anyway. 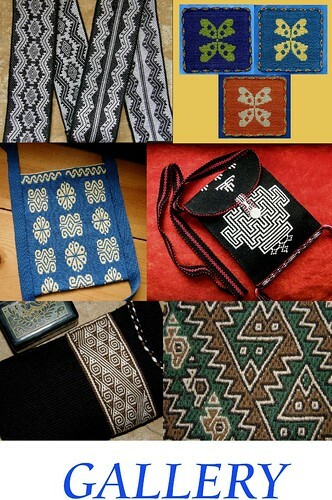 Although the backstrap weaving class that will take place in Santa Cruz California is already full, Janet is thinking about having a workshop just like in April up at her place in the Spring next year and I’m definitly attending that again. That was really nice. It is so nice to hear what you have been up to. You have no idea how happy it makes me to hear that you are weaving, enjoying pebble weave and planning lots of short and long term projects. I hope we get to weave together again some time soon. Weaving at Janet’s is always fun. Hola Laverne!!! que bueno encontrarte en la web, me menejo mejor con el español por eso este idioma para decirte que admiro tus trabajos, son simplemente hermosos. Aceptas algunas consultas? tejo con telar de cuatro cuadros(loom floor).Gracias por la generosidad en tus tutoriales, son muy didacticos y voy a comenzar a practicar!!! Hola Cris. Gracias por tus comentarios. Si, acepto consultas aun que a veces es imposible contestar y solucionar todos los problemas por el internet! Hi Laverne, thanks for this. As with all your tutorials they are well done and a joy to follow. I have a question regarding finishing the braids. A knot at the end can be large – especially with larger yarn and 4 or more strand braids. The picture in your tutorial, but key fobs don’t appear to have knots at the end. How do you keep them from unraveling? Thanks for writing and I am glad that you are finding the tutorials useful. You are in Lao…how interesting! I agree that a knot on the end of the braid can be too big. I paint diluted craft glue onto the very ends. As the glue dries I squeeze and taper the ends so they don’t look too blunt. The ends will get hard so try to put the glue only on the very tips. Of course I only do this on things that won’t get wet or be washed. Thanks Laverne, I figured it was something like that. While I first saw backstrap looms when living in africa (when visiting Ghana ) I really got interested here in Lao where they are used in Salavan province. Your tutorials got me going and I have since been able to have a lesson with a young woman here. They do it slightly differently here – they weave a continuos circle of fabric, and hold the far end of the frame with their feet! I can do it for a while, but then revert to tying it off to something! Thanks for your information online. It has made all the difference to me – while this country is full of weavers, they lean heavily towards large floor looms and the language can be a challenge as most of the weavers are village woman with little or no english. thank so much for this I could follow it. working on x-mas gifts and using this to make a necklace to hold some jewerly my husband made. Felicidades por tu página, espectacular los tejidos y las técnicas a seguir, pero para mi como muchas otras personas que no dominamos el idioma inglés, sería fantástico que también enseñes en español. También me encantaría adquirir tus libros y si tienes en Chile algún representante para comprar, muchas gracias por tu atención. 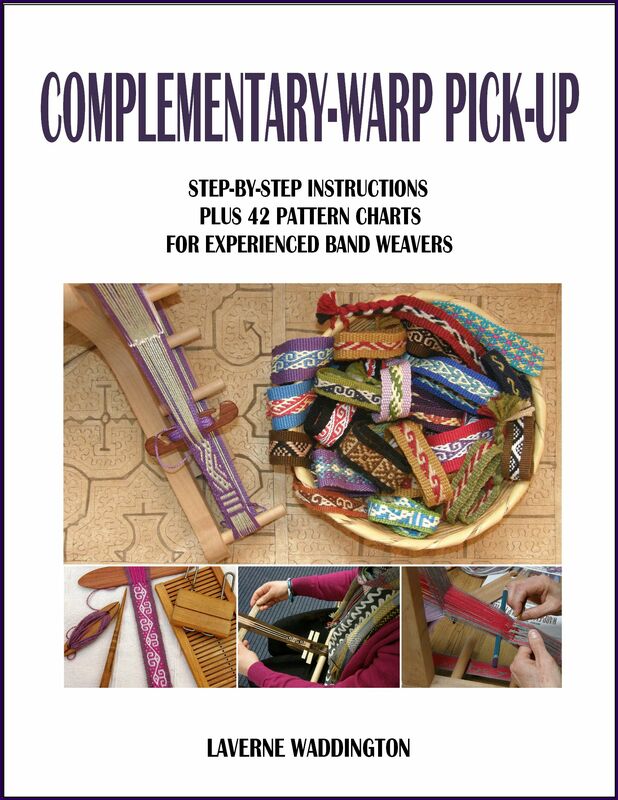 I found your step by step instructions extremely helpful and would like to thank you for them, however I couldn’t make any sense out of the other two braid patterns you mentioned. Could you please give some more information on the other two? Thank you.I am glad that you enjoyed the step-by-step instructions for the four-strand braid. I am not sure which two patterns you are talking about. Could you be more specific, please? Yes, you did the step by step for the B A A B I think it was and showed three photos below that illustrating the finished braid and two additional versions.. You described that the letters (B and A) would be switched around to make the different patterns but I couldn’t make it work. The braid in the center picture has a thread order of B-A-B-A. This simply means that instead of always having two threads of the same color crossing in the center, you will have one thread of each color doing so. The threads shown as A1 and A2 in the first step-by-step picture will be red and white rather than both red.The same goes for the threads shown as B1 and B2….one of each color instead of both white. That will be your starting position and the threads will then cross and move in the same way shown in the tutorial. Okay, I think I understand now, thank you! I thought they were completely different braids, not that they were just different colors, so I was very confused. Thanks again, great guide. Thanks for the video instructions. You make it look so easy. I can’t wait to try it. DIY Speaker cable leads. No I’m not kidding. Weaving four insulated smaller wires in the B-A-A-B pattern results in an Interlaced Dual Twisted-Pair cable. In your example, white would be one twisted-pair, orange is the second twisted-pair. This weave pattern yields a cable of lower electrical resistance, while providing noise rejection that a single thicker wire doesn’t have. Key for high-current delivery and/or to low impedance speakers (exotics, cars). Also great when you only have smaller gauge wire than you want for your application. For this use, don’t weave the wires as tight as the example shows (the wire will resist this too), but do make it even tension. Weave it, bare and join all four wires at each end. Make one weave for the positive connection and another for the negative connection.Teflon, FEP or foamed FEP insulation over copper gives much better sound quality than other insulation. I’ve been searching all over for an easy and reliable way to: weave it, and with consistent tension. Interesting! 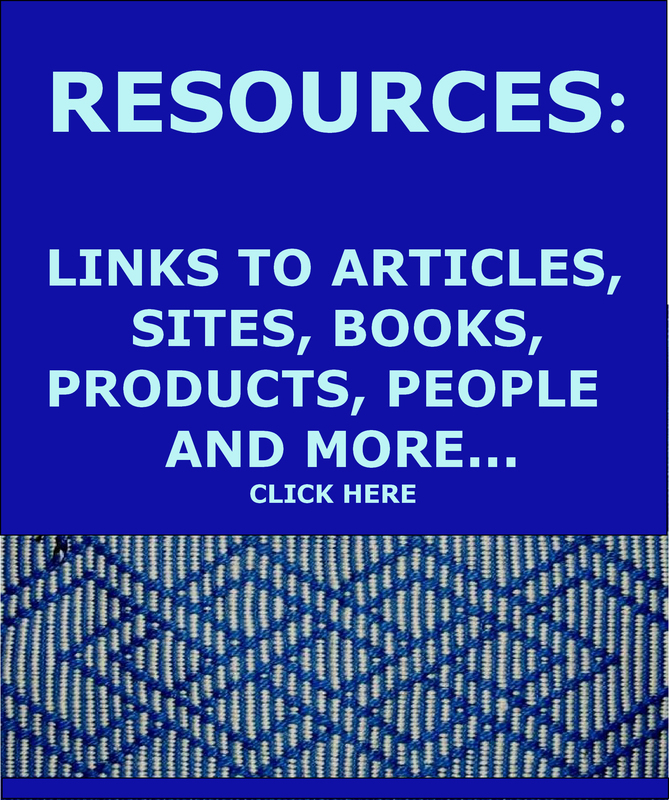 It’s nice to know that there is this surprising practical use for the four-strand braid. Well, I sure didn’t expect to find instructions on how to get the wires into the configuration required on this kind of site! But it works! I did goof a bit. The “for this use” above, is for getting the least resistance for high current use. To get the Interlaced Dual Twisted-Pair noise cancellation, once the weave is done, you cross connect the twisted pairs. Which means: join one white and one orange at one end, join the same two wires at the other end (continuity meter), then join the remaining white-orange wires together at each end. Run your positive/live through one of the new white-orange pair, and the negative/ground through the other. Michael, thanks so much for explaining your method for braiding wire into speaker cable. Appreciate having my curiosity raised about noise reduction & reduced R.
You can follow the step-by step photos on the page and just start with your threads in a different order…red, white, red, white istaed of white, red, red, white as shown. They will give you the candy cane spiral that you see in the center of the picture. It is very simple, however, how did you begin at the top where you tied it? Thank you. There is no special way to begin. Just tie the strands together, arrange the colors according the version you are wanting to create and start braiding. Fantastic tutorial. Thanks. Love the loop method on your video too. You are very welcome. Have fun with it! How do you end the braid? Ending…it depends on the application of the braid. I am most often braiding the unwoven warp ends of a woven band and I tie a knot, or wrap the ends with a thread and have the edns haging out as fringe or put a bit of glue and squeeze the ends together as the glue dries. Ok thanks for the quick response. Wonderful tutorial, thank you! This will be a perfect way to have a matching strap for my woven purse. Do you know the approximate “take up” of the braid? For example if I want a 36″ finished length do I need to start with 72″ of each strand? I am sorry, Gillian but the take up amount is something I have ever measured or bothered to record…it’s a good question!. I am sure that you will be fine if you double the length of the strands. You will want to use the first method I show in photos and not the finger-loop method I show in the video as it is very hard to maintain the right amount of tension if you are working on something really long and trying to finger-loop braid. You will find that the free ends of your strands will tangle when you use the first method but that is not a problem. Just stop every now and then and take one strand at a time and pull it through the others. You will find that it is easy to get everything back in order once again. Just don’t attempt to grab all the ends and wrangle them apart! Thank you so much for your quick reply. I’ll do a test braid first and try it out. Forgive a foolish question from an admitted rank amateur. You call ALL of these 4-strand braids. I count 4 strands in your step-by-step pictures. But for the life of me — I count EIGHT strands in the ‘loop’ method shown in your videos There are 4 loops and it takes 2 strands to make each loop. How do you manipulate these 8 strands and wind up with a 4-strand braid. They are doubled strands. Each loop of two strands is really only acting as one doubled strand. I could make any braid and simply use two strands as one to make the braid thicker. Think about how many individual strands of hair are in each ”strand ” of a typical three-strand hair braid. We are essentially debating semantics. I DO LIKE the procedure — it clearly looks easier than either of the methods I have used to this point (I’m used to 3-strand flat, very new to 4-strand round). I just need to try it a time or two and see how the final product looks compared to 4 single strand. THANKS AGAIN — And again, your page and the demonstrations are GREAT.